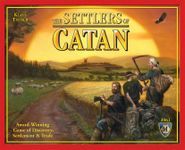 "The Settlers of Catan" (not "Catan") edition. Condition: Very good. Everything collected in base game box, Explorers & Pirates box, and Seafarers 5-6 Player Expansion box. Inserts are gone. Boxes have moderate shelf wear. Base game box has "CMW" written on bottom in black sharpie.